Sage was lost at the Clarence rest stop on I-90W around 11 pm on 1/17. 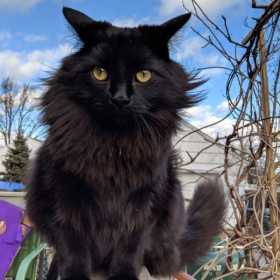 She is a black, long haired cat. On her head, she has a few gray hairs, and she had gold eyes. We were traveling, and she is not familiar with the area. She is likely in the neighborhood behind the rest stop, as several people have checked it with no sightings.